Per fess embattled purpure and Or, a decrescent and a laurel wreath counterchanged. Meaning: Hadchester was originally called Hadrian's Keep, referring to the Roman defensive fortification Hadrian's Wall (Latin: Vallum Aelium) and the forts strung along said wall, begun in AD 122 during the rule of Emperor Hadrian. It is known that gates through the wall served as customs posts between the Roman conquered southern England and the wild northlands. The revised name, Hadchester, means Hadrian's Town. 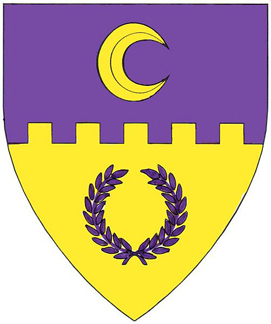 Blazon: Per fess embattled purpure and Or, a decrescent and a laurel wreath counterchanged. The Caristia - Spring, on or about the first Saturday in March. Orchard War - Summer, traditionally during Pennsic in late July. This page was last edited on 14 August 2018, at 21:43.